Ticket price € 4,00 (valid for 2 days and to visit 4 sitesi archeologici : the Neronian-Flavian Amphitheatre - Cuma - Archaelogical Museum of Phlegraean Fields, Castle of Baia. 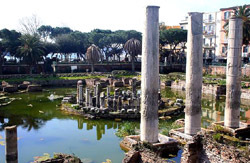 Solfatara of Pozzuoli : it is a shallow volcanic crater at Pozzuoli, near Naples, southern Italy; it is part of the Campi Flegrei volcanic area. 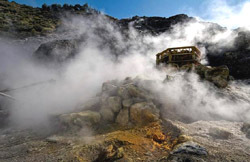 It is a dormant volcano, which still emits jets of steam with sulphurous fumes. 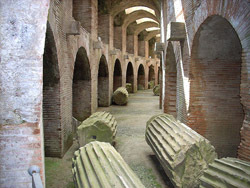 The Flavian Amphitheater: It is located in Pozzuoli, is the third largest Roman amphitheater in Italy. Only the Roman Colosseum and the Capuan Amphitheater are larger. It was likely built by the same architects who previously constructed the Roman Colosseum. The name Flavian Amphitheater is primarily associated with the Roman Colosseum. Antro della Sibilla: The famous cave was discovered by Amedeo Maiuri in 1932, the identification of which he based on the description by Virgil in the VI book of the Aeneid, and also from the description by an anonymous author known as pseudo-Justin. 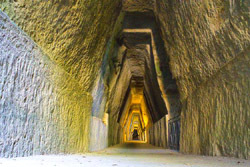 The cave is a trapezoidal passage over 131 m long, running parallel to the side of the hill and cut out of the volcanic tuff stone. THE PRICE OF THIS TOUR IS EURO 250. ENTRANCE FEES ARE NOT INCLUDED.